Seismic retrofitting is a major endeavor that requires bracing and bolting an older building to its foundation so it doesn’t shake apart in an earthquake. But depending on a building’s age and what materials it’s made of, a traditional retrofit has the potential to destroy a structure in a different way—aesthetically. 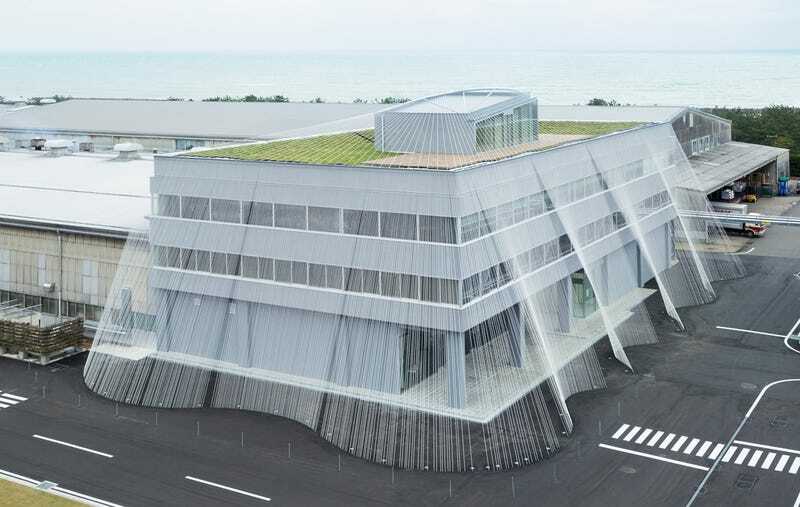 A Japanese company believes strings of carbon fiber could solve this problem, so it wrapped them around its headquarters to demonstrate how this might work. The super-light seismic reinforcement material named CABKOMA Strand Rod is made by the Komatsu Seiten Fabric Laboratory, which is based in Ishikawa, Japan. Yes, fabric: It’s a carbon fiber core, wrapped in additional fibers, and coated with a thermoplastic resin. A 520-foot piece weighs less than a garden hose and can be carried in one hand. Carbon fiber is one of the best ways to absorb shockwaves without adding bulk. It has a very high tensile strength; in fact, it’s as strong as steel, but 90 percent lighter. And unlike rigid rods which require drilling for installation, the Strand Rod is a flexible, whisper-thin band that is secured using screws and an adhesive. It essentially works in the same way as the traditional brace-and-bolt, but instead of anchoring the building’s walls to its foundation, it tethers the roof of the structure to the ground so that when the big shake hits, the entire building moves together. Komatsu Seiten recruited the legendary architect Kengo Kuma and Ejiri Structural Engineers to collaborate on a visionary application for its headquarters, where they’ve used the Strand Rods as an architectural element. The strands drape off the side of the building like a harp, then are attached to the building’s frame below the ground. The video above shows how the interior walls were strengthened by adding webs of the stuff throughout. This doesn’t necessarily mean Japan will go wrapping all buildings like rubber band balls. With the space the strands add to a structure’s footprint, it’s certainly not practical for dense cities or taller buildings. But I could definitely see it being used to protect a fragile landmark in a seismically active area that might not survive more invasive construction. Plus, the thin ribbons of carbon fiber look beautiful on their own. Think of it as a well-designed architectural safety net.